Derby & Blue Tier Old School Trails are rippers ! ﻿"I can go anywhere in the world and ride machine built trail, but I can't go anywhere else to ride the Blue Tier Descent. 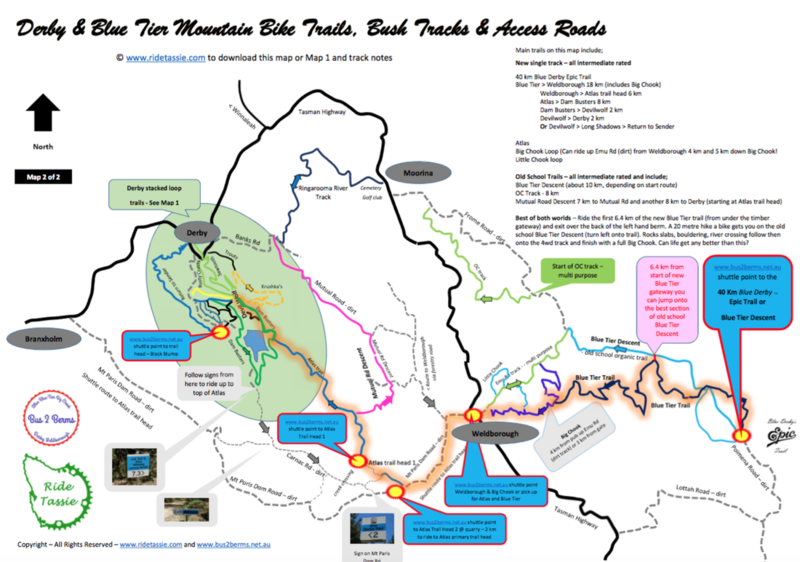 The oldest and the original trail that has brought mountain bikers from around the world to north east of Tasmania is the Blue Tier Descent. Wil Barrett (see above quote) has summed it up in a few short sentences and yep, it leaves you smiling from ear to ear. This is OLD SCHOOL at its very best and is a must ride with your mates. The article and photography by Hamish John sums up the Blue Tier Descent very well and was written prior to World Trail building new trails related to the Blue Derby project, including Big Chook. 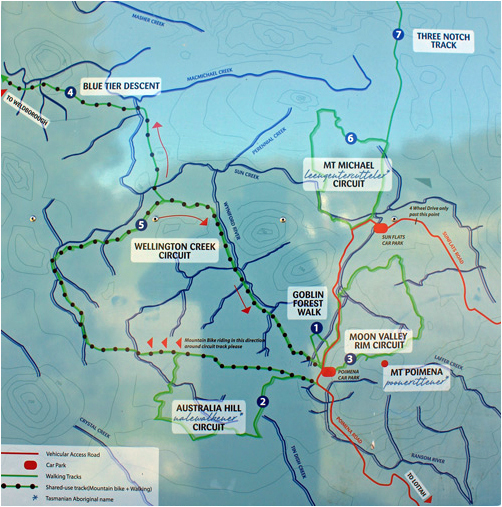 The above map shows you the new Blue Derby trails and the old school ones. Yep, you have over 200 km of trails here. Best book in for 5 days if you want a taste of it all or come back for second map. Feedback from riders from Australia & around the world has described 3 of the 4 the following old school trails as MUST RIDES when coming to the Blue Derby region. When you want a break from endless berms and smooth Blue Derby trails, these old school trails are awesome and something very different! Please Note - These old school trails are multi use. That is, MTB, motocross and the odd 4WDer. Take care. Old Mutual Rd Descent which comes out at Ringarooma River Bridge and 4 km to Derby. One of the reasons the Blue Tier Descent is held up in high esteem is that it's a of an adventure to get to the start. You either need to get a lift up to the start at Poimena or ride your bike. (you can also try and get a commercial shuttle via this link). You can either ride your bike via the road (see below) or via Emu Road (the way you go to the Big Chook trail) and up via the Blue Tier Descent. From the Weldborough Hotel, head east 6.6 km on the Tasman Highway until your reach the top of the pass. Turn left onto the dirt road, which is Lottah Rd. Travel along this 7.8km and then turn left onto Poimena Rd. Travel 3.8 km until turning right onto Sun Flats Rd. Travel 1.5 km ish up into Blue Tier Reserve. The start of the trail is at at the old mining township of Poimena (nothing there now!). This area is known as the Blue Tier Reserve and has a drop toilet and picnic tables. Camping is also allowed, but no fires. Once at the reserve, you have two options to get to the start of the Blue Tier Descent proper You can either follow the Wellington Creek walking circuit via Australia Hill (preferred route is clockwise due to walkers going anticlockwise) or via the new Blue Tier trail. This is the preferred way as you miss a fair bit of rubbish trail on the Wellington Creek trails. If you ride via the new Blue Tier trail, set your computer to 0.0 km and start under the new Blue Tier trail timber gateway. Ride 6.4 km along the new trail and you'll hit a left hand berm. Ride off the back of it and hike a bike for about 20 metres. You'll see some dead branches, where the machine was brought in the build the new trail. When you hit the old Blue Tier Descent trail, turn left and enjoy your ride! You are now on the descent proper. Have fun as you go down one of the most organic trails you'll ever ride. Eventually, after a few creek crossings, you'll come to the Frome Rd / Emu Rd junction. There is an old sign pointing to Weldborough at this junction and you can make your way along Emu Rd (old 4wd track) until you get to the start of Big Chook trail. Turn left and hook down Big Chook or keep riding straight ahead. This will take you to Emu Rd and 1 km up gravel road to the Weldborough Hotel. 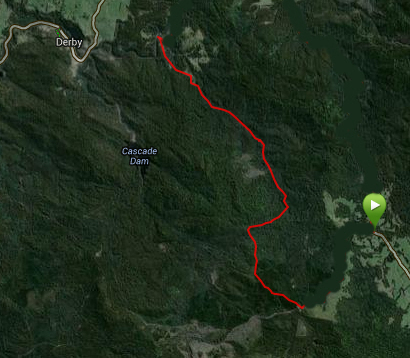 If you plan to ride the OC Track, you head down the forestry road called Frome Rd. Old Codger gives the name to this track, although it has been confused with RC. Not sure why. This track is old school at its best. Easy, flowing trail that descents 450 metres in just 7 km. Virtually no up, except at the end as you come out in a logging coupe. The problem is getting to the trail head or getting back to where you started. Either way, you'll have to ride up unless you have a good mate. The OC track trail head is on Frome Road, which is just south of the Moorina Golf Club, which is about half way between Derby & Weldborough. Option 1. If you have a great mate, a car shuttle is the best option. Head up Frome Road 7 km, which is a forestry Rd and meet you mate back at the bridge at bottom of Frome Rd. Option 2. Ride up Frome Road (7km). Park the car just over the bridge, about 200 metres along Frome Rd. It's a 450 metre climb then back down the OC track. This is about 14 km ride. Option 3. Ride from Welborough Hotel, up Emu Rd (as you would go to Big Chook) and continue along Emu Rd until you get to the Weldborough sign. Right takes you up the Blue Tier Descent and left takes you onto Frome Rd, which is the way you need to go to get to OC track. Trail head is about 2.2 km from Weldborough sign, down Frome Rd. Once you get to end of OC Track, ride though logging coupe and you'll hit Frome Rd. Left takes you to Tasman Highway or right takes you UP Frome Rd to Emu Rd / Big Chook & Weldborough. About a 30 km round trip. Trail Head is difficult to find. Once in, it's very easy to follow. about 7 km from the bridge at the bottom of Frome Rd or 2.2 km from the Blue Tier / Emu Rd junction. This track is normally ridden from the Mutual Rd end although you can ride either way.